On March 21, 1949, at noon, WTVJ started the day with the test pattern and remained on until 7 p.m., when WTVJ premiered with 25 minutes of news, weather and sports during a two-hour broadcast day. The bulk of the programming brought the stars of the day to South Florida's roughly 2,000 television sets. But the quality of those sometimes weeks-old shows forced the station to quickly evolve. Back in 1949, downtown Miami was a sleepy little place -- but it was about to wake up. 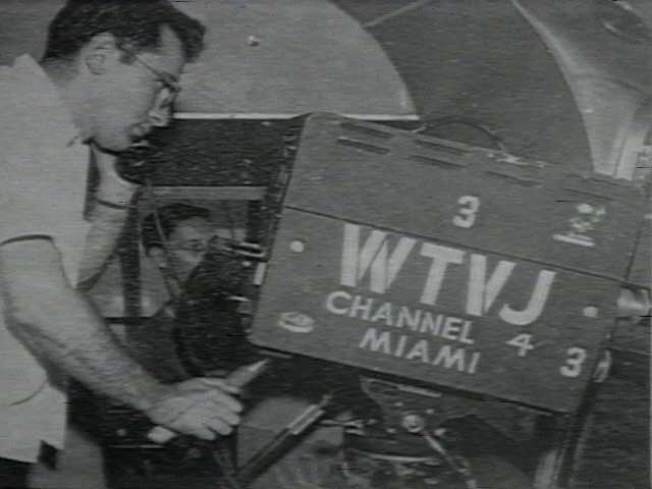 WTVJ was born in the old Capitol Theater at 316 N. Miami Avenue as the brainchild of theater chain owner Mitchell Wolfson. The NBC 6 family broke ground on our new state-of-the-art home in Miramar in 1999 as we celebrated 50 years of groundbreaking in television -- the underlying commitment to you is one shaped by over half a century of pioneering. Our new station complex in Miramar opened in September 2000. WTVJ was Florida's first television station -- the nation's 16th. Ralph Renick was hired right out of the University of Miami as the station's first news director, but there was no newscast. Despite that, he started the first coverage of hurricanes when one hit in 1949. Back then, they didn't have names and we didn't have a weather department. WTVJ stunned south Florida when it carried the first live coverage of the Orange Bowl parade also that same year.In 1949, WTVJ presented The Old Redhead himself, Arthur Godfrey. It was Miami's first network television show. In the early '50s, we invented television, producing 125 hours of live shows each week. Network shows were shipped in up to a month late. In 1952, South Floridians had their television sets tuned to "The Gary Moore Show". It was on Gary's show that a another young star was introduced to the nation -- Miss Carol Burnett.In 1950, the Korean War began -- and so did the Ralph Renick Report, our area's first TV newscast.By 1951 Bob Weaver was a staffer and started the first weather report, but also did news, wrote documentaries, announced and performed a dozen other jobs. Bernie Rosen also started with Weaver as an intern in 1949 and wound up a nationally-known sports director. "In the '50s... WTVJ had more firsts than the Yankeess had World Championships," Bernie said. 1952 was also the year that WTVJ dedicated a new television studio. At 7,000 square feet, it was the largest TV theater in the south and opened in November 1952. In 1953, Don Porter was the TV boss of Miami's popular "Private Secretary," portrayed by Ann Sothern.In 1956, America's most famous TV couple, Lucy and Desi were brought to Miami by WTVJ and the town went wild. The same year, WTVJ presented what was to become one of the most successful and long running series on television -- "Gunsmoke." Also in 1956, WTVJ went to Sarasota to send back live pictures of the circus with 10 cameras in the Big Top and two on the midway. In 1957, Chuck Zink ("Skipper Chuck") started the first kids show, "Popeye Playhouse," a big event for South Florida kids. First underwater remote on Jan. 20, 1957: For "Odyssey," underwater cameras televised live a sunken Spanish galleon and reconstructed a treasure hunt. The WTVJ mobile unit, the worlds largest at that time, was taken out to sea 3 miles from Plantation Key on a barge for the program. In 1957, Ralph Renick went on the air with the first daily television editorial in the nation. In 1969, Jane Chastain became the first woman sportscaster on television in the country. In 1968, C.T. Taylor was the first African American journalist on South Florida airwaves. The first Orange Bowl game broadcast live. It was also the first ever network broadcast from the Goodyear blimp. And now, the tradition of "firsts" continues. The years rolled by and as we start the 21st century, WTVJ/NBC 6 becomes the first station to move to Broward county. The station also has a studio at the American Airlines Arena in downtown Miami to maintain our major presence in Miami-Dade County. WTVJ will be the first digital station in the Miami market, meaning sharper images and more timely information than ever before. But for all that, the underlying commitment to you is one shaped by 50 years of pioneering.